A 35-yard freekick from Barry Shuttleworth, in the first minute of the game, gave Alty their needed win against Runcorn. Keeper McMillan got a hand to the ball but failed to keep it out. Alty gave another good team performance to keep Runcorn out and created a number of chances themselves in the rest of the game. Alty finished 12th in the table and Ashton's loss meant that Runcorn also qualified for the new Conference feeder division so there were mass celebrations at the end of the game. The attendance of 874 was Alty's best for a home league game this season and the best today in the UniBond. 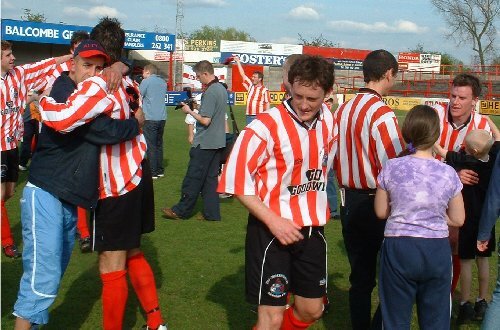 This was the most important game for Altrincham since their end of season game against Kidderminster Harriers in 2000 which could have saved them from relegation from the Conference. The weather was much the same as that day- bright sunshine and warm temperatures. Alty lay 13th and Runcorn 12th at kick off. Though anything less than a win by Ashton United at home to Harrogate this afternoon would have ensured both Alty and Runcorn's qualification for the new Conference feeder division next season, both teams had to go for a win to be certain of qualifying automatically. 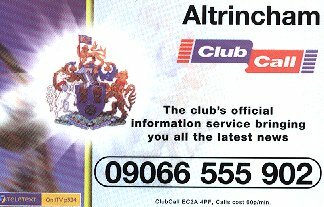 The gate of 874 was Alty's best for a league game this season and the best since October 2002 when Stalybridge were the visitors, watched by 897 spectators. Alty's injury problems continued right to the final game, with Steve Aspinall having to cry off with a recurrence of the injury picked up a fortnight ago. However, Barry Shuttleworth had recovered from his chest infection so Stephen Rose switched to right back. The undemonstrative Rose, like Peter Band, has played in a host of different positions for Alty this season without ever letting the side down. Runcorn were unchanged from the side which beat Emley on Thursday, though Kissock and Parkinson replaced Platt and Tamm on the bench. Compared with the side which Alty beat 3-0 at the Halton Stadium in March, only defender Peter Ellis and striker Lee Kissock were missing from the starting line-up. 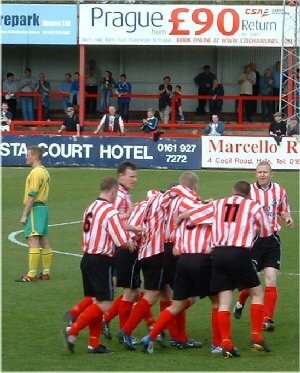 ALTRINCHAM (Red & white striped shirts, black shorts and red socks): 1. Stuart COBURN, 2. Stephen ROSE, 3. Barry SHUTTLEWORTH, 4. Mark MADDOX, 5. Gary TALBOT, 6. Ged KIELTY, 7. Gary SCOTT, 8. Ian CRANEY (capt. ), 9. Marcus HALLOWS, 10. Peter BAND, 11. Stuart WRIGHT. Subs: 12. Matt BAILEY, 14. Stephen LUNT, 15. Jamie BAGULEY. RUNCORN FC HALTON (Yellow shirts & socks, green shorts): 1. Tony McMILLAN, 2. Michael GARRITY, 3. Matty McGINN, 4. Ged NOLAN, 5. Tom SPEARITT, 6. David NESS, 7. Anton LALLY, 8. Dominic MORLEY, 9. Chris LIGHTFOOT, 10. Ged COURTNEY, 11. Carl RENDELL. Subs: 12. Lee KISSOCK, 14. Paul ALDRIDGE, 15. Scott PARKINSON. Altrincham kicked off towards the Golf Road end, with both sets of supporters turning out in good numbers and giving their sides excellent support. Alty won a freekick in a central position some 35 yards out. Barry Shuttleworth fired in a dipping left-footed freekick which McMillan managed only to knock against the underside of the bar as he dived to his top right-hand corner. The ball came down off the bar before he gathered it but the linesman, Mr Bendish, awarded the goal - with just 50 seconds gone. After some harsh decisions against us this season, Alty have enjoyed two favourable linesmen's decisions in a week to redress the balance; the awarding of this goal and the ruling out of Whitby's last-minute 'equaliser' last Saturday. Left: Barry Shuttleworth is surrounded by team-mates as they celebrate his goal. Nolan shot very wide from 20 yards from a freekick soon afterwards (4 mins) before Coburn easily caught a cross from Lally. Shuttleworth did well at the back to clear another Runcorn probe before play stopped for an injury to Craney (9 mins). Rose was also doing well at right-back as Alty kept their goal well protected. Indeed, it was Alty who should have scored again after 13 minutes. McMillan, possibly unsettled by conceding the opening goal, boobed again when his kicked clearance only found Craney 40 yards out. In a similar situation at the Halton Stadium in March, Craney had scored from the keeper's clearance but this time he shot comfortably wide as he tried to lob the stranded Runcorn keeper (13 mins). Then Hallows was played in from another poor kick by McMillan and after Wright and Craney had combined, Hallows was set up for a shot but delayed long enough for cover to arrive and ended up shooting high over the bar (14 mins). The sides continued to trade forward movements but neither produced a meaningful threat to the other's goal. Band, as ever, was battling hard for Alty in midfield where Kielty, too, looked assured. But it was Craney who was Alty's most lively threat whilst for Runcorn, player-manager Chris Lightfoot was wining more than his share of headed flick-ons to keep Maddox and Talbot busy. Runcorn won the game's first corner (23 mins). Coburn gathered this at the second attempt. Graham Heathcote told his players that they were playing "too deep" as Runcorn began to apply some pressure. However, the visitors' defence did not appear totally composed. Graham Heathcote continued to advise his team from the sidelines, now telling them to "Relax!" as Mark Maddox made a hurried clearance. That was easier said than done as the players must have been feeling the same tension as their supporters. When Band was fouled, Shuttleworth's freekick found Craney but he was seen off. However, he was soon back threatening the Runcorn goal when he made space well on the edge of the box but the Alty captain, this time, took one touch too many and McMillan smothered the ball (31 mins). Talbot then saw off Rendell from a Lightfoot nod on, as Coburn was kept well protected. The Alty keeper did have to field a low, routine shot from Courtney from Morley's pas, however (34 mins). But Alty responded with a move to the other end from which Craney fed Band, but he sliced his effort very wide (34 mins). Runcorn then won another corner when a shot by McGinn was deflected out of play. This was cleared and then Hallows underlined the whole Alty team's determination by tackling back to win possession. Garrity, the former Alty man, got a lecture for a display of petulance as Alty won a throw. Soon after this, Band's harrying allowed Kielty to nick possession and feed Hallows but the striker was just blocked off inside the box. Alty's next threat came when Maddox found Craney, who got past Ness, but his curling shot just passed McMillan's right upright (39 mins). After a brief stoppage for Lally and Band to be jointly lectured, news filtered through that Ashton had taken the lead. This added to the pressure on Alty and Runcorn as neither could be certain of promotion without a win if Ashton were to gain three points. Maddox then stuck out a crucial leg to clear a potentially dangerous pass from Rendell. Wright and Scott were doing well on the flanks, battling hard for possession as Coburn remained the less busy of the keepers. However, it was a surge up the middle rather than the flanks by Wright which prompted a talking point. Wright had advanced through the centre circle when he was tripped from behind by Lally, who escaped a booking or even a freekick award against him as the referee waved play on (44 mins). As the 45 minutes ended, Craney threatened again but in the two minutes of added time, no more serious threats of a goal came at either end. Alty went into the break with one foot in Conference North and as Harrogate had equalised at Ashton, Runcorn too were on the verge of achieving qualification, too. Runcorn kicked off but as in the first half, Alty almost scored in the opening minute. Following a Scott throw, Maddox headed the ball to Craney whose shot from the edge of the box was held by McMillan (46 mins). Runcorn's best early effort came when Lightfoot's flick found Rendell, but his pass, under pressure from Talbot, just evaded Courtney (51 mins). A great ball from Rose was then just taken off Scott's toes inside the box (52 mins) and a minute later Rose repeated the act with a great curling ball forward on the right past Ness and into Craney's path. He won a throw by the right corner flag (53 mins). Courtney did get in an underpowered shot soon afterwards but the flag was raised in any case (55 (mins). A sliced clearance from Maddox gave Runcorn their third corner of the game but again it was Hallows, deep in his own half, who cleared. Alty did have some concern when Lightfoot's header from a cross was not held by Coburn but the Alty keeper got up off the ground to fall on the ball just ahead of Courtney (56 mins). Now, Steve Lunt came on for Stuart Wright, on the left (56 mins). Maddox then made a fine clearance from Lightfoot as Runcorn pressed for an equaliser. Alty now brought on Bailey up front in place of Hallows (60 mins).Rose then took three successive throws for Alty as they edged up the right touchline before Runcorn got a freekick on the edge of the Alty box, which Coburn gathered (63 mins). Coburn's smart clearance set Scott off up the right and this led to a foul on Band by Spearitt. Shuttleworth took the freekick from 25 yards out in a central position. His left foot curling freekick found Gary Talbot, advancing by the near post but his header went over the bar (64 mins). Alty were now looking fairly comfortable and Garrity's sliced shot, very wide, from 25 yards caused Coburn no concern (67 mins). Alty threatened again when Craney's shot forced a good save from McMillan from the edge of the box (68 mins). But when Courtney won a freekick 22 yards out, Coburn had to produce a fine save to tip the curling left foot freekick over the bar for a corner on the Runcorn right. From this Lightfoot's header hit the back post and was cleared for Runcorn's fifth corner, on the left. This was cleared as Alty played on with ten men whilst Lunt changed his boots. Alty now endured some sustained pressure as three more Runcorn corners followed in the next five minutes to make the corner count 8-0 to the visitors. The first corner was controversial as the referee overruled the linesman's award of a goalkick to Alty. Coburn caught the corner and soon after this Courtney put a shot from the edge of the box (74 mins). The second of this sequence of corners came as the ball went dangerously across the Alty goalmouth but Alty survived the pressure. Alty had now switched Lunt to his youth team role of striker and Alty now began to get out of their own half after several minutes sustained Runcorn pressure. Craney was now lying deeper as Lunt received the ball from Bailey. As Lunt got in his shot from an awkwardly bouncing ball, McMillan was out smartly to block the ball (79 mins). With just ten minutes left, Altrincham were now looking to have ridden the storm. Runcorn brought on Kissock for Lightfoot (81 mins) before a freekick from the left by Shuttleworth found Talbot whose nod on found Bailey. With his back to goal, the on-loan Stockport County striker, headed wide of McMillan's left post (81 mins). After Talbot had cleared a Garrity freekick the ball came, via Bailey, to Craney on the left. He got past Ness, who chopped him down just inside the Runcorn half. Ness was booked (84 mins). Runcorn mounted some late pressure without seriously threatening a goal against a resolute Alty defence. Their best late chance came when Kissock headed poorly wide at the back post (87 mins). Alty now brought on Baguley for Lunt (87 mins). With the game into its two minutes of added time, Runcorn gained corner number nine, for which even goalkeeper McMillan went forward. Maddox robbed the keeper of a Jimmy Glass moment by taking the ball off his head as the corner came in from the Runcorn right. Barry Shuttleworth was named as Man of the Match, for scoring the all important goal and for a solid all round display. At the end, the delirious Alty supporters and players were joined on the pitch by those of Runcorn FC Halton, who had heard that they, too, had qualified for the Conference North, thanks to Ashton United's 3-4 defeat by Harrogate Town.